Released earlier this year, the Nautiz X2 gives users an all-in-one mobile computer that can handle almost anything. 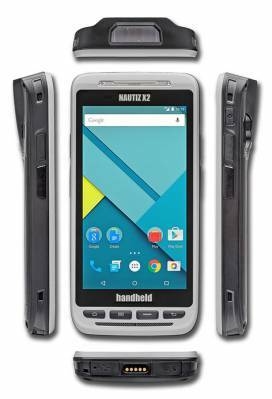 With built-in ruggedness and the ease of use of a modern Android smartphone, the Nautiz X2 integrates a high-quality scanner, camera and mobile phone making it one of the best handheld devices on the market. Computing power from a quad-core processor and easy-to-use Android 5.1 Lollipop OS. High-quality, high-speed industrial-grade 1D/2D scanner with three dedicated scan buttons. An integrated camera offering the clarity and versatility of 8 megapixels, with autofocus and flash. Google GMS certification – allowing users to use Google maps, and have access to the Google Play Store. 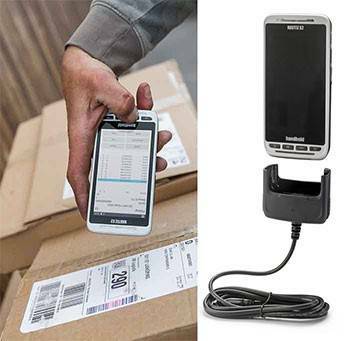 Unlike other devices on the market, the Nautiz X2 is extremely durable, taking full advantage of Handheld’s experience of building rugged mobile computers. The Nautiz X2 is tough enough to handle the conditions in your warehouse as well as outdoor environments. With the ability to withstand temperatures between -20C and 60C, water and dust resistance (IP65, IEC 60529) and shockproof up to 1.22 meters, the Nautiz X2 is built to survive repeated drops and punishing weather conditions. The Nautiz X2 is slightly thicker than your average phone so that it can accommodate the integrated 1D/2D laser scanner, replaceable battery and physical ports and controls. Despite this, the footprint of the Nautiz X2 is almost identical to that of the Apple iPhone 7 Plus. Compared to the latest consumer smartphones which have almost no hardware buttons, the Nautiz X2 has four physical buttons below the display, making the device easy to use in all conditions. With a 4.7 inch screen and weighing in at only 230 grams, the Nautiz X2 is not only sleek, but ergonomically shaped, making it easy to hold and operate. Handheld has been delivering high performing and reliable devices for years – now the Nautiz X2 takes that tradition to new heights.